A call to strike fear into the most hardened fisherman. And for the 18-man crew of a Fleetwood trawler the call came at midnight in heavy seas off the east coast of Iceland. It was September 14th 1960 when the drama involving the 397-ton Lord Lloyd began to unfold. Water began to enter the engine room when the coal-burning trawler reached the fishing grounds. The vessel began to sink in a 45mph gale some 30 miles from shore. The men took two rubber liferafts – lashed together. First over the side was the youngest member of the crew, 16 year old Cliff Martin of Blakiston Street. His first trip in Lord Lloyd was a galley boy but on this – his second voyage – he was sailing as a “brassie”. As the liferafts tossed and turned a Belgian trawler moved in to the rescue and took the men aboard. The crew was led by Skipper Bill Spearpoint whose son was mate. As daylight broke the crew saw the Lord Lloyd still afloat. Soon on the scene was the Wyre Mariner Commanded by Skipper Percy Bedford. The rescued seamen were transferred to the Mariner – and the fight to save their ship continued. She was taken in tow and Skipper Spearpoint and 3 others went back aboard for the trip to Seydisfjordur. Fireman James Leader later described the state of the trawler. “You could feel the water rushing under your feet when you stood in the galley. We counted the rungs on the engine room ladder to check the rise in the level. “The engines were covered in water – 30 tons of coal had been washed into the stokehold and the fish room was flooded. “But it was probably the fact that she was so well ballasted that kept her afloat. “Luckily the gale died down during the night,” said Mr Leader. The tow lasted 11 hours but the drama had not ended… for the British and Icelandic governments were still negotiating on fishing limits. And as the Wyre Mariner reached Seydisfjordur Skipper Percy Bedford towing the crippled Lord Lloyd… was arrested. Charged with illegal fishing inside Iceland’s self-imposed 12 mile limit some 2 months earlier he was fined £1,900. He told the court that he had no indications he was suspected of illegal fishing. He had obeyed orders to stay outside the limits since May. It was alleged that on the day in question in July an aircraft had flown over the mariner for three and a half hours signalling it with rockets and flashing morse. The coastguard plane took eight fixes showing the trawler was inside the limits. The vessel did not heed the signals. Skipper Bedford said he hadn’t seen any aircraft. 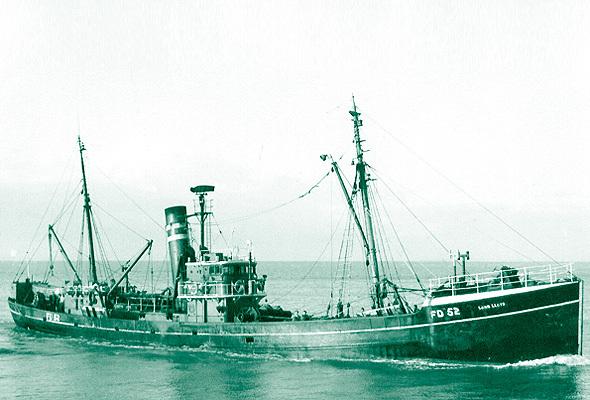 Wyre Trawlers Ltd – owners of both the Lord Lloyd and Wyre Mariner – declined to comment about Iceland’s action. But there was little trouble over fishing limits when the rescued crew landed at the Icelandic port. There was some booing from a crowd on shore as the trawlers were escorted in by the Icelandic gunboat Thor. “They probably thought we’d been nabbed for illegal fishing,” said one deckhand. But on the whole the crew got a friendly reception. Skipper Bedford’s only comment on the court action when he reached Fleetwood was, “It was a shabby trick. He said the Lord Lloyd had been on the verge of sinking when Mariner reached her. Three weeks later the ship that refused to sink returned to Fleetwood. With Skipper Spearpoint were half of his original crew who had remained to help with repairs after the rest were flown home. The 42-year-old skipper of Hatfield Avenue said the crew had done a good job. Tons of coal had to be moved from the engine room a bucketful at a time. Water was estimated at 10ft deep in places. An Icelandic frogman sealed the leak below the waterline allowing the pumps to remove the water. Skipper Spearpoint said the trouble had been caused by an underwater projector of the echo-sounder breaking away from the hull. First published in Life in Fleetwood issue 33, summer 1994.